We present blind predictions using the solubility parameter based method MOSCED submitted for the SAMPL5 challenge on calculating cyclohexane/water distribution coefficients at 298 K. Reference data to parameterize MOSCED was generated with knowledge only of chemical structure by performing solvation free energy calculations using electronic structure calculations in the SMD continuum solvent. To maintain simplicity and use only a single method, we approximate the distribution coefficient with the partition coefficient of the neutral species. Over the final SAMPL5 set of 53 compounds, we achieved an average unsigned error of \(2.2\pm 0.2\) log units (ranking 15 out of 62 entries), the correlation coefficient (R) was \(0.6\pm 0.1\) (ranking 35), and \(72\pm 6\,\%\) of the predictions had the correct sign (ranking 30). While used here to predict cyclohexane/water distribution coefficients at 298 K, MOSCED is broadly applicable, allowing one to predict temperature dependent infinite dilution activity coefficients in any solvent for which parameters exist, and provides a means by which an excess Gibbs free energy model may be parameterized to predict composition dependent phase-equilibrium. 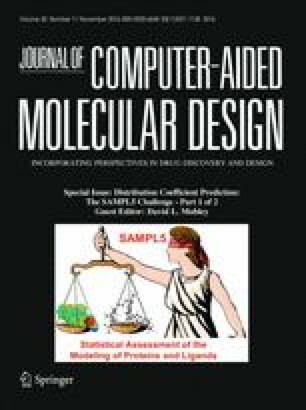 The online version of this article (doi: 10.1007/s10822-016-9945-9) contains supplementary material, which is available to authorized users. The authors are grateful for the assistance of Dr. Rafiqul Gani (DTU) for providing a copy of ICAS 17.0 which was used in this work. Computing support was provided by the Ohio Supercomputer Center.